A couple weeks ago we were craving a big spicy sandwich. Something that we normally never have and we wanted it to be a classic. We tossed around the idea of a burger; NO! A sloppy hot dog with all the fixings; NO! Roasted turkey with spicy mustard: NO! Then it hit us, how about a Spicy B.L.A.T Sandwich. YES! We ran to the store picked up some white bread after all a classic sandwich has to be on fluffy white bread. Then we fried up some meaty Applewood bacon. Buttered the bread and pan grilled it. Thinly sliced some fresh avocado and tomatoes. Washed up some baby lettuce greens. Tossed together with some good ole mayo with a little (okay, a lot) Sriracha. Then we devoured it; it was perfect, spicy, salty and creamy (thanks to the avocado). There you have it …. the Spicy B.L.A.T. What is your favorite way to make a BLT? Butter both sides of the bread and pan grill, over medium heat, until toasted; about 3 – 5 minutes per side. Remove from the pan and set aside. In the same pan, cook the bacon until crispy. Lay the pieces of bacon on paper towels, to remove any fat. I like to pat them a little, to remove any excess. Mix the mayo and the sriracha together and set aside. Slice the avocados and tomatoes. Build your sandwich: put a thin layer of the mayo on each slices of bread. 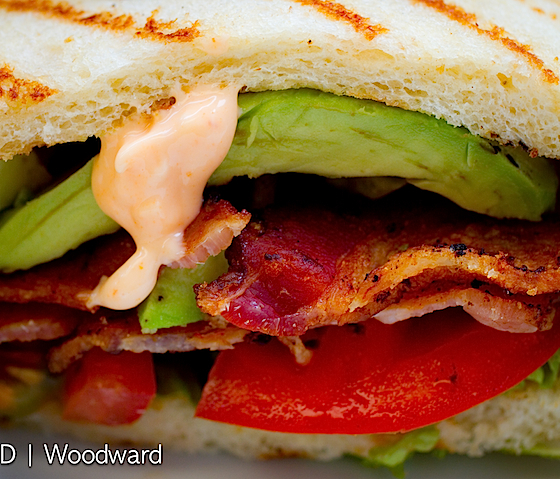 On one side, lay the lettuce, tomato, avocado and then the bacon; top with the other bread slice. Serve extra mayo/sriracha sauce on the side. 5 Responses to "Spicy B.L.A.T Sandwich"
This looks yummy, will have to give it a try. Maybe a little spicy for me, but man I could go for one of these right now!! 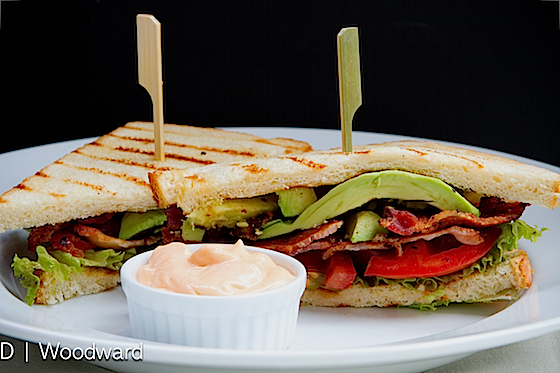 Nothing better than bacon and avocado, LOVE IT! Be still my heart!!! Love this!